If you are a fan of Minecraft, you cannot miss Mine Blocks 1.26.5. An exciting adventure with memorable events will go with players from the beginning to the end. Typical features of Minecraft games are found in this game including exploring, searching, cutting, storing, and crafting. If you are expecting to experience new features in each new version, you are very likely to satisfy with Mine Blocks 1.26.5. New features of the game are skins, lemons, Minecarts, slimes, sticky pistons, and commands. These new features will contribute towards maintaining players’ interests during the game. 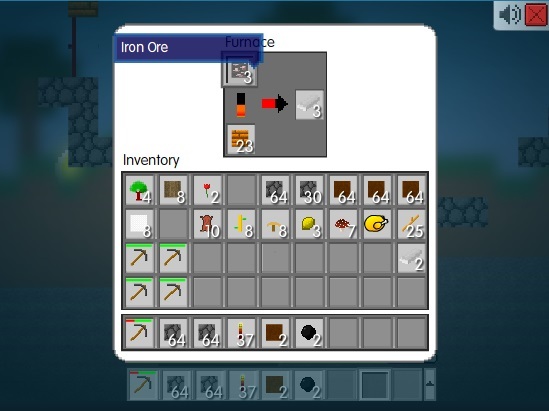 From basic materials, players are supposed to construct advanced ones so that players can make powerful weapons and make necessary equipment (e.g. armor) to fight with monsters at night and build walls to prevent monsters. In addition, 10 hearts are 10 times that you can survive after being hurt by monsters. All materials can be taken advantage of to make useful things in your adventure from wood, soil, stone to orange bamboo. You are able to build magnificent structures on the ground to prevent enemies, and build amazing buildings under the ground creatively. You may not own legally enough space and money to build what you are dreaming, but in Mine Blocks 1.26.5 you can make this come true. Let see how you can survive in a new world and how much you can transform this world into a wonderful one! Share with us about a new image of your new world, and please go straight if you want to contribute any ideas. Mine Blocks is one of typical and awesome games inspired by Minecraft. Once you create a name for a world, that time you have officially owned that world. It belongs to only you. Then you can explore and build things throughout any corners of this fertile land in which you can plant your seeds of imagination here. Ask yourself one question that you want to create if you have an enormous world? Are they robots, buildings, letters, plants, animals, aliens, or dishes from blocks? Your dreams are completely possible to come true. Now, make a name for your own land and start chopping wood first! A big store of Minecraft game Online are for you at Minecraft Game. When people mention Minecraft, they are going to talk about magic blocks. Those marvelous blocks are going to help players develop their intelligences and creativity through plenty of tasks. Though the graphic of Minecraft games is not as impressive as other games, Minecraft games create beneficial conditions for players to explore and design freely in the way they like. In addition, many surprising situations are plus points for Minecraft games. If you are ready to explore, dig, craft, and even fight against a horrible enemy, welcome to Miencraft game! => Movements – Players can use either Arrow Keys or WASD to move, but WASD is usually preferred. You can walk with Right and Left, and run or sprint with double tapping. Pressing Up or Space helps you jump, and pressing S to help you crouch. => Mining – you place the mouse where the block you want to mine, and then click and hold. => Placing – you enable to select a certain block by either clicking into it or pressing number keys. => Crafting – Inventory is the place you will craft, equip, and do other tasks. By pressing E, you can open it. There are hundreds of creating recipes, but the crafting process usually starts with wood. In the Instructions, it has provided players with basic recipes already such as ladders, chests, torches, wooden, iron and stone pickaxes, tables, sticks, and wooden planks. => Furthermore, the steps to do a farm, train a wolf, create a skin, make a nether portal, access the ender are described briefly in the Instructions. Another source of help is FAQ. The FAQ section is the section where you can find answers to common questions raised by other players. => If you have not known how to craft a thing, please send your questions to us, or you can ask the community for more support. Each player has a series of playing experiences, so by exchanging and sharing experiences you can know more tips about how to play Minecraft Games Online.